Where do I begin? We got on the road to Primm about 9 am. 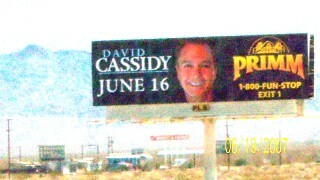 Just as we were coming onto the 15, we saw posters for up-coming Primm concerts, I thought for sure that David's had been taken down, but just past the biggest thermometer in the world, there He was!! We checked into the Primm Valley resort at noon, & with our room key was a letter about a meet and greet & if we had any questions to contact the casino host. Well, I went there & he said he didn't arrange that & I should contact the entertainment department. I called there & left a message to call me on my cell (she never did call). 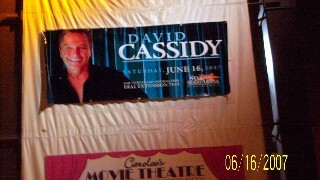 There were posters of David up all over the casino, including over the slots. I liked the photo they used. Then we headed for the box office & picked up the ticket, Turns out I was on the wrong aisle of the section, but at the end of the row close to the door. I went back up to the room after losing about $5 at the penny slots, & rested. I was too excited to eat, so I had a meal on the go bar & some water & rested. When the doors opened, I was let in first. I watched the crowd trickle in -- the floor looked full, but there were plenty of seats open at the sides & behind. Then, I spotted Frank, the bass player, & was struck with a flash of inspiration;I decided to give him a copy of my newsletter & see if he would allow me to join the M&G. I went to the barricade set up around the technical equipment, & waved to him. He seemed to recognize me, & I showed him my newsletter & explained how I ran the fan club & would it be possible to see David to get a few new photos for the newsletter? He conferred with the security guys, & one of them told me that he would take me up at 7:30, if I would wait by the stairs. It was 7:20, so I said thank you, straightened my hair, freshened my lipstick & (for good measure) popped a breath-mint! The guard met me & took me up, where I met other people with laminated passes. I was the first one through the door of the lounge, where a buffet was set out. There was David, who spotted me first & greeted me with a "hi, sweetie! ", with that famous Cassidy grin. The woman in charge had a camera to take photos of us with David (we couldn't use our own cameras, although we could take candid shots later. As I stood next to David, I said, "you smell soo good, what cologne do you use?" He kind of stuttered a bit, then admitted he couldn't remember. He said the past 3 days were the toughest he could remember & he had to still warm up & do some stretches before the show, so no autographs were signed. After he left, I asked the woman in charge how to get copies of the photos & she said the Casino host would have them in a few days & that they would contact me. I told her this wasn't arranged through the Casino, & gave her a copy of the newsletter (luckily, I'd brought several) so she would be able to reach me --I also e-mailed the host directly. On my way back to the seat, I thanked Frank & the Security Guard again for their help. Well, there we all were, young & old, fans & people who were just there because the tickets came with the rooms. The lights went down, stage lights flickered, & the drum beat started with “Hush.” David came out in the same white, woven long-sleeved shirt & black trousers he had met me in just 15 mins. earlier. He followed with the remix version of Heartbeat, Albuquerque, Echo valley, Summer Days, Crossroads, Hey, you’ve got to hide your love Away, Blackbird, and another song I missed (my camera jammed and I had to pull out my battery & change the card). Common Thief followed. After a wild rant putting down Los Angeles & CA, he went on to do the remix version of Cherish, (interrupted by an autograph seeker with a PF lunchbox & thermos—he actually laid down on the stage to sing to her! Band intros & C’mon Get Happy came next, followed by I woke Up In Love, I Think I Love You & the Finale of I’ll Meet you Halfway. 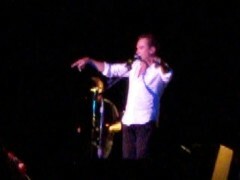 Most of the songs were Remix versions, which were a bit hard to adjust to, but the audience seemed to like them. I walked out himming. As we came back to the room, the posters were being removed from the hotels & casinos slots. My mom managed to intercept one from a gentleman ready to take it home for itself. It was the long one that fit over the top of a slot & was slightly too long for out sedan! We had fun on our way to Vegas trying to get in & out of the car!